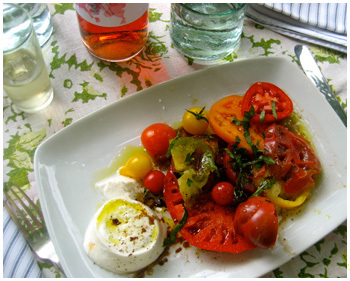 Hierloom tomatoes and Buffalo Mozzarella of course! It doesn’t get much better. In Prince Edward County we’re lucky to have some amazing growers….Vicki Emlaw and Tim Noxon set the bar at Vicki’s Veggies. Last weekend they hosted their annual Hierloom Hurrah! tasting. See the slide show at http://www.vickisveggies.com/Home.html. (If you’re in Toronto, they’re at the Green Barn Market every Saturday at Wychwood Barns). And Ontario ‘Bella Casara’ Buffalo Mozzarella is available through Quality Cheese. Double Hurrah! 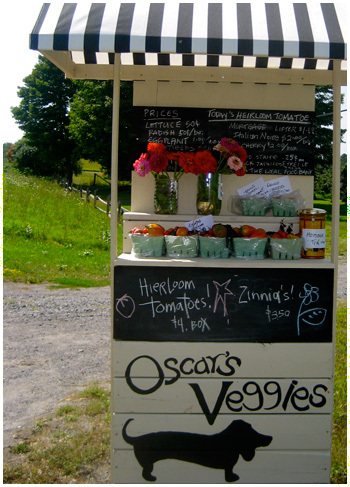 Oscar’s the new hot vendor on the block, located just outside Cherry Valley in the County. Heirloom tomatoes and colourful bouquets of fresh cut Zinnia’s are for sale, perfect to get anyone out of the dog house! Operated by artist Susan and gardener extraordinaire, Glen Wallis, And supervised of course, by the President hound dog, Oscar.